Earlier this summer I got inspired to join the “daily art” movement, and create some kind of sketch or painting each day. I love the idea of it! But I know that given my super-irregular work schedule (and also my personality), there’s just no way that would last longer than say 9 days. SO, I’m going for a slightly looser version, and will shoot for doing something new each week, which I’ll post here on my blog and have for sale on my brand new Etsy shop. I’m calling this project “Weekly Art Wednesday;” so stay tuned and check out how I do with this little personal challenge each Wednesday! 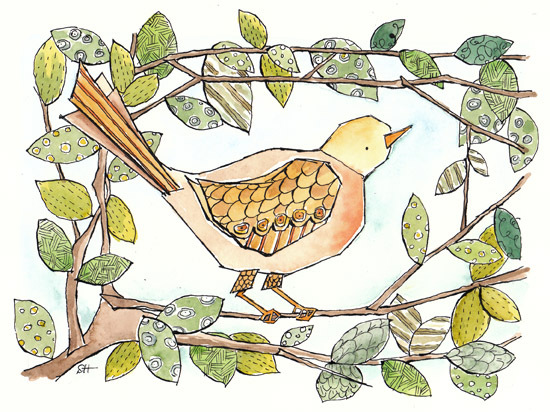 Here’s this week’s piece…I know bird motifs are everywhere right now…but there’s a good reason for that—birds are just simply wonderful! I painted this today, so it’s fresh off my work table.